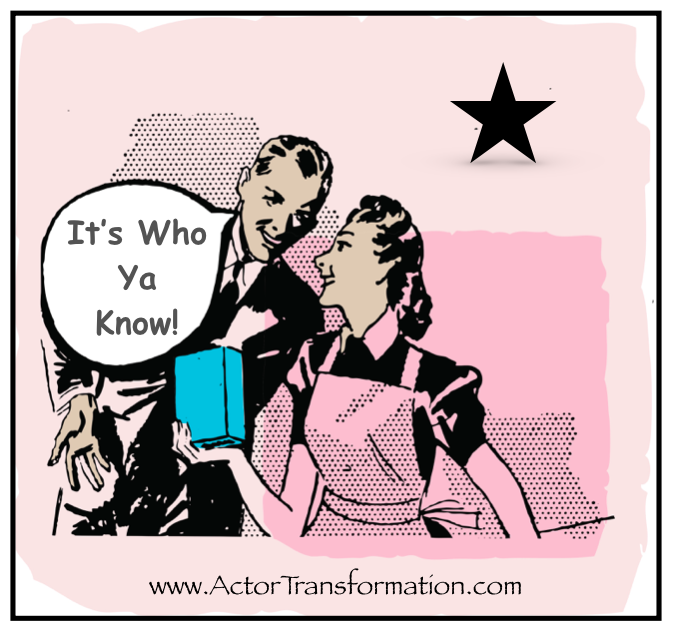 A common phrase has been circulating around Hollywood for years … “It’s who ya know”. Sometimes this little phrase gets a bad rap. When a role is given to the producer’s nephew who has never acted before or the sought after lead goes to the director’s wife, yeah, that can be a bummer if you are not on the receiving end of that generosity. But if you can step back and look at this phenomenon objectively, it also sometimes makes sense, doesn’t it? First off, some roles are actually quite disposable. So even if the producer’s nephew is new in the biz, he might be quite capable of saying “Here’s your coffee sir” just as easily as anyone else can. And it might not be necessary to spend money on a casting session for a simple role. An added bonus is that the producer gets brownie points with the family at Christmas dinner. And by the way, talent just might run in the family. Some family members might be what they call “a natural” simply from being on sets and around the business their whole life. Certain people in the biz get more opportunities simply because of the people they know and who knows them. Everyone wants to work with individuals that they like and trust. And truth be told, if all things were equal and you were in a position to help a friend over a stranger, wouldn’t you? Careers are often built with the same filmmakers and artists working together over and over again. The first chance might be luck, but after that, one must deliver each time they are hired. Over and over. Which brings up an interesting topic. A lot of actors already have friends in the biz but they are afraid to ask for help. They shy away from asking an industry friend for help or a referral out of fear that they will come across as “using” their friends. But here is a little secret. There has NEVER been an actor since the times of Thespis who has reached success without some help. No actor is an island. ~ A casting director recommends an actor to a talent agency. ~ A showrunner introduces her latest arm candy to network. ~ A writer asks a group of actor friends to participate in a staged reading. ~ An actor introduces another actor to his photographer. ~ A writer writes in a character for their best friend. ~ An entire cast brings their “plus 1” to their world premiere and many new connections are made. Incorporate this into your daily actor to do list, and pretty soon YOU will be the one that Hollywood knows!